Running is technical as much as it is simple and everything is relative. For the elite sub 2:10:00 marathoner, trying to claw away one or two seconds might be the hardest thing they've ever done. For the newbie into running who's losing weight and making good improvements in short or middle distances, things may not be that difficult. Everyone is looking for ways to improve and have their own battles to fight. While there's so much advice and fluff out there on how to run and how not to run, fundamentals rarely change. Let me tell you what I've found. In my younger high school days, I was a somewhat of a runner and excelled in fast running, perhaps because the 100m dash was the most popularized form. Being of skinny stature, I could pick myself up and move quite briskly, enough to irritate bullies. Running competitions in Physical Education class pit boys against boys in a mad dash on a mud ground. No one told us about tying our laces, wearing the right shoes, hydrating our bodies for hot weather, proper running form to avoid injury. Instruction was next to terrible. But one thing sure was obvious to us as kids. Old or fat folks just couldn't run. If you were a "fatty" or a "budda" (old in Hindi), you were slow! They would never catch you so you had a warm fuzzy feeling that you had the upper hand in mischief! As years passed, I went into more serious running in college. I entered 3K's, 5Ks, 10Ks, half marathons and subsequently the marathon. During those races, some shameful experiences opened my eyes and forced me to rethink hard ingrained ideas. First, I wasn't as fast as I wanted to be. Fine, that's a given going into any competition. But here was the deal - I was getting passed by 50 year+ Caucasian men in the marathon. I was getting passed by a heavy set 40 year old in the 5K race. And how is it that this wrinkled female of 60 perhaps was enduring this race longer than me? I stopped. She didn't. Wait a minute, I'm skinny, I'm fast right? I'm doing 7 min/mile for chrissake. I couldn't have been more blind. 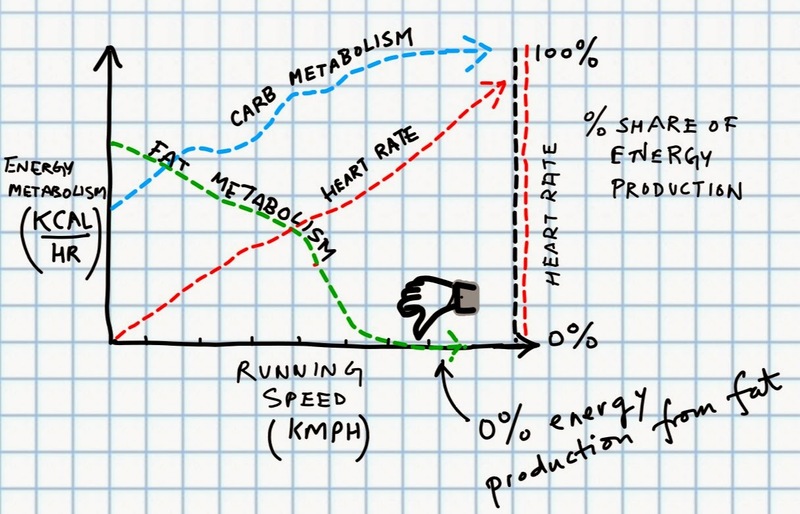 The physics in running is pretty simple. Physiologically, if you can run at the same speed as me but with lower oxygen demand, you are more economical. You have more margin if you have to pick up speed than me since I'm hopelessly near my red zone. I will tire. You will not. The human engine differs from the internal combustion engine in that not only do we adapt and repair quite well, multiple energy systems ensure we have energy at the right rate for the right time. The carbohydrate system gives you lot of energy at fast rates but reserves are limited - maybe about 2000 kcal. The more ample fat based energy system, about 80000 kcal gives you energy at low rates but for longer times. So the key to endurance is as simple as it sounds - to train your engine to operate in an area as far away from the line that turns an aerobic effort into an anaerobic effort. If you are genetically predisposed to operating in this manner, all the merrier. This fundamental lesson didn't strike me as important until I went to an exercise lab to undergo testing. Using data conducted by qualified exercise scientists, I can show you what a typical metabolic profile looks like for running. I say typical because this is what an average person might show. On the x axis is running speed in kmph. On the y axis is Energy metabolism in kcal per hour. The plot tells me my base resting HR, the slope at which HR climbs relative to running speed, the ball park heart rates corresponding to running speed, the % share of energy from carbs and fat for the load under consideration and point beyond which my engine is only burning carbs - my red zone. The data is indicative of why you run the way you run, excluding mental and other factors. The perspective is powerful and can be applied to tailor your workout zones. Assume you're the average runner going into a head to head long distance run with a well trained but sub-elite 60 year old. This person with an operational engine that is mostly aerobic and needs lesser oxygen for the same running loads is a better runner from the get go. 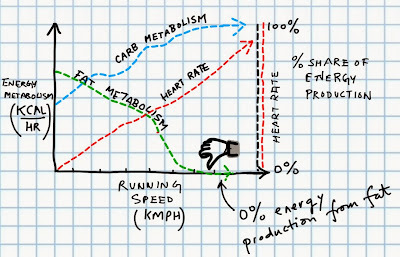 In the diagram above, that individual's % fat metabolism line might be remarkably flatter for long distance running with a suitably positioned point at which that % decreases, going into anaerobic. You on the other hand rely on carbohydrates way more than they do, and since those stores are less, you won't be able to keep digging for a long time. As the body produces various metabolites, you begin to fatigue.The end result is that you enter a region of no return, when you have to swallow your pride and either stop or slow down to bring your heart rate down. The same idea may extend to people with "bigger' bodies who are seamless high intensity, short distance runners. My theory is that anyone who can store more glycogen in his muscles and use that efficiently is a better runner than those skinny types. The doc has prescribed that I return to my fundamentals. The advice is sound. I'll be emphasizing aerobic training in my workouts for the next few weeks and will go in for another bout of testing to see what changes have happened. Meanwhile, be comforted in the fact that the "old" and "fat" can in fact become good runners. You just have to go out and see how your body performs, so there's really no substitute to knowing yourself. Age is just a number and running is fascinating to me as it forces you to leave behind pre-conceived notions about anyone.